In Riviera Nayarit luxury means magic, and Bucerías will embrace this very magic on January 18 – 20 at its Street Festival. The festival will include the Chalk Walk, the Taste of Riviera Nayarit and the Handcrafts Fair – three simultaneous events for the enjoyment of all visitors. 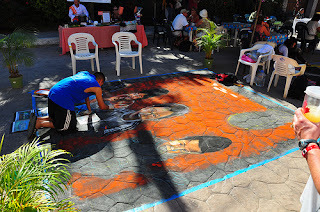 Three years ago, The Art Walk Plaza, an organization dedicated to the promotion of culture in Bucerías, organized the Chalk Festival for the first time – known today as The Bucerías Chalk Art Walk – a competition that assembles Mexican and international chalk artists, who create their work on the streets. The concept has evolved since then, integrating innovative ideas like The Taste of Riviera Nayarit, a gastronomic fair that includes the participation of the most important restaurants in town, and the Handcrafts Fair, where different local artists will showcase their products, all within the framework of the Street Festival. In 2012, artists will compete to obtain the top awards with chalk art designs inspired by Mexican cuisine. There’ll also be chalk-drawing workshops for 150 children in Bucerías on Friday 20. The Taste of Riviera Nayarit event will feature over 20 participating restaurants, which will offer a ‘taste’ of their menu during the festival, with prices of $10, $20, and $30 pesos. It’s important to mention that during the three days of the event, the Lázaro Cárdenas Street, which runs parallel to the beach in the Zona Dorada area of Bucerías, will be closed to traffic between the streets of Benito Juárez and Galeana, as there will be stands setup for restaurants and for people selling handcrafts, while artists create their designs on the pavement. The Convention and Visitors Bureau (CVB) of Riviera Nayarit congratulates Christy Beguesse, founder of this movement, as well as every participant for the strong impulse to the development of the economy in our destination, as events like this contribute to promote and to help attract visitors to our destination. in San Blas where is it?? Anonymous, Carnival of San Blas was held by the end of past february... as all of the traditioanl Mardigrass festivities. San Blas is located about two hours and a half away from Nuevo Vallarta driving north of the coast.